Like many old homes, historic commercial buildings also require ongoing care and, occasionally, some unique maintenance. Cast-iron buildings are no exception to this rule as George Mitchell and the Mitchell family have found with their 1871 Thomas Jefferson League Building in historic downtown Galveston. Mitchell Historic Properties (MHP) is currently completing the third major restoration of this building since the Mitchells took ownership in 1976. The League Building was the first of more than 20 historic buildings purchased by the Mitchells in what was later to become The Strand National Historic Landmark District. 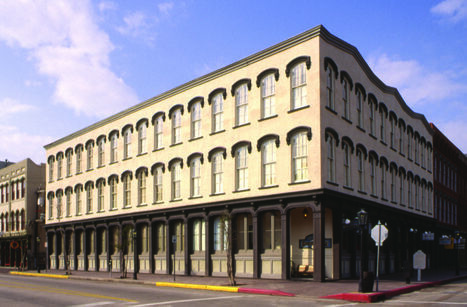 The original restoration of the League building in 1979 started a renaissance of Galveston’s downtown area and led to further investment by the Mitchell family and other individuals and entities. Following Hurricane Ike in 2008, building owners found that rising saltwater and cast iron are not a good mix. The League Building was flooded along with the rest of downtown Galveston. After Ike, MHP was quick to repair the damage to its buildings. But in 2010, MHP staff noticed fractures in the cast iron columns around the League Building and its other buildings. MHP owns five cast-iron buildings. After opening and investigating a few of the columns, standing saltwater and mud was found within the panels as well as deteriorating structural conditions. Steps to repair the damage began immediately and are still underway. Workers found that some columns had concrete poured against the cast iron, others had masonry brick work inside, and some had a small concrete base around a steel structural column. All of the columns had a large amount of rust from the inside face of the cast iron. The rust and breakdown of the concrete was pushing the cast iron out resulting in the fractures and movement of the columns. Even the relatively new columns that had been added to the building in the 1970s and early 2001 were rusting on the structural steel columns. To restore these columns, MHP has faced some unique challenges. Crews have to create a formwork system that supports the building’s structural columns and the upper weight of the cast iron fronts. This requires welding two steel channels five to six feet above the sidewalk to the existing steel columns. Once these loads are transferred to the formwork, the lower four feet of the structural columns are replaced and welded into place. Simultaneously, the front and sides of the cast iron store front are cut out at 80 inches above the sidewalk and replaced. The new cast iron sections are specific to each column location and are confirmed by a laser scan of the building that was completed prior to the removal of the columns. The League Building project began in 2010 and is scheduled to be completed in the summer of 2012. A total of 28 cast iron columns are set to be replaced. The replacement cost for the cast iron columns is $210,600. The Thomas Jefferson League building was constructed in 1871 on the site of Moro Castle, Galveston’s most famous saloon which was set ablaze to cover the burglary of the Cohn Brothers clothing emporium on December 3, 1869; a fire that destroyed a large portion of Galveston’s central business district. Thomas Jefferson League was an attorney and the son-in-law of one of Galveston’s founders, Samuel May Williams. The Thomas Jefferson League building was built in the Renaissance Revival architectural style. Its original iron fronts were cast by the Southern Ornamental Iron Works of New Orleans, Louisiana. The second and third floors are constructed of Houston brick and were originally crowned with galvanized iron cornices. The building was initially divided into three stores: the I. Bernstein & Co. clothiers who occupied three stories of the corner of the building, the Robinson & Company stationary and printing business, and Woston, Wells & Vidor cotton factors and commission merchants. Throughout history, the building had a number of other tenants including the Ben Blum & Co., a wholesale hardware outlet that occupied the whole building from 1921 to 1972.